Home > Bicycle Tourism > What’s the BEST ride in Iowa? What’s the BEST ride in Iowa? We need your help Iowa readers! We visited Iowa last year and got a small sampling of some of the riding possibilities in the state. RAGBRAI is synonymous with bicycling in Iowa, but we want to dig a little deeper and share what people are missing. What surprised us were the sheer number of rail-trails, as well the small businesses and bars that were targeting bicyclists. We’ll be returning in early June to highlight some of the best riding in the state and need your help finding out what we should ride. Grinding some gravel outside Grinnell with Craig from Bikes to You. Will be glad to visit in the summer! So if you’re from Iowa or have ridden in Iowa, what is your favorite ride? It can be anything from an epicurean multi-day tour on a rail trail; a scenic day ride on some of Iowa’s gravel roads; or some sort of ride that challenges the expectations people have about Iowa (what’s the hilliest ride in Iowa?). We’re also looking for rides that pass by some great food and beer of course : ) We’re completely open to suggestions. Leave a comment or email us! Loved discovering lots of bike friendly businesses in Iowa. big tent and welcoming = ragbrai. Tour? I haven’t done it, but riding the missisppi is on the bucket list. I know it should be obvious, but RAGBRAI is the best cycling experience in Iowa – multi-day ride with 10,000+ other cyclists…. but – that’s July. So, June – The Bacoon Ride – on the Racoon River Valley Trail – 73 miles (give or take a few miles). Beautiful rail trail, fabulous communities. What is the difficulty of the Raccoon River Valley Trail? I’m sixty, not in the greatest of shape. It’s pretty flat, though you will have to deal with wind. It’s a great beginner trail to explore! Taco Ride – Thursday nights from Omaha/CB to Mineola, IA. 4th of July one is amazing and a blast. Recommend riding back at night! I grew up in Eastern Iowa and had family from to Dubuque to the Quad Cities. There is some very scenic roads along the Mississippi. Friendly folks. Trans Iowa! I’ll be racing 331 miles of Iowa gravel next month. Awesome! Good luck on your race. We’ll definitely be checking out some gravel rides in Iowa. Have any routes that you like to do? Thanks Johnny. Definitely looking into the Wabash and the Taco ride. The loop on the Raccoon River Valley Trail! About 72 miles through a variety of landscapes and right on the edge of Des Moines. Very different ride according to time of year. So many. I spend most of my time in the Iowa City, Johnson County area. Sugarbottom road is an iconic road ride for locals and will cure others of the notion that Iowa is flat. Take it from IC to Lake McBride. If you are up for a longer adventure continue to Solon and up to Suttliff. The Suttliff bridge is an 1800’s bridge over the Cedar River restored as a park with a dive bar at one end. Beautiful place, beautiful ride. 2015 Ragbrai will be taking this route. Any gravel in the area is great, but favorites include the TriCounty Bridge Rd to Iowa River Road especially when the leaves are turning. Dubuque, Decorah areas have great riding too gravel or pavement. 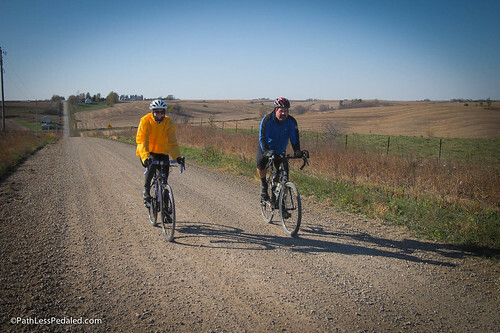 People enjoy gravel rides in the Grinnell area. Hope you’ll come back and visit us again this summer! The gravel scene in Grinnell is one of Iowa’s best places to grind. Tbe Rock Creek watershed loop leaving and ending in Grinnell is not for the faint of heart or people who don’t like climbing. Grinnell, the start and finish of the world famous trans Iowa race. Gravel! Bikes to You in grinnell is the place to stop before and after a grinder. The gravel scene in Grinell is hard to beat. Bring your lungs though. Home of tbe start and finish of tbe trans iowa. GTDRI – Guitar Ted Death Ride Invitational. This is one of the most fun gravel centuries in which I have partaken. Viva Iowa gravel!